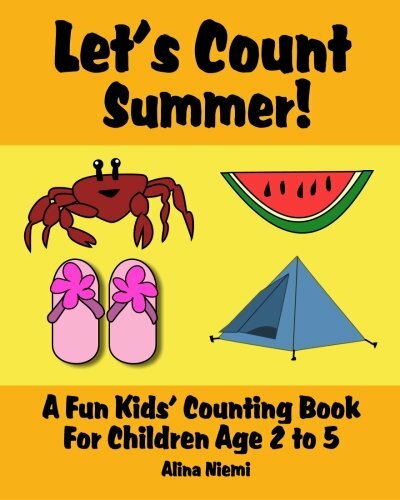 Let's Count Summer is a fun book for your toddler or preschool child to help learn their numbers from 1 to 20. There are colorful cartoon illustrations of different things you see during the summer season or at the beach or swimming pool. Pictures include sand castles, fish, watermelon, crabs, lemonade, beach towels, umbrellas, and balls. Your child can point to the objects while counting and learning about the seasons. Get a head start on your little one's education with this engaging book. For kids who are learning their numbers and counting, usually between ages 2 to 5. Check out the other counting books in the "Let's Count" series, including Let's Count Trucks!